My wife and I decided to tour parts of Italy for our main summer holidays this year. One part of the of the voyage was a drive along the Amalfi coast then a stop at Herculaneum, the small Roman town that got covered with by the same volcanic pyroclastic flow as Pompeii back in 79 AD. 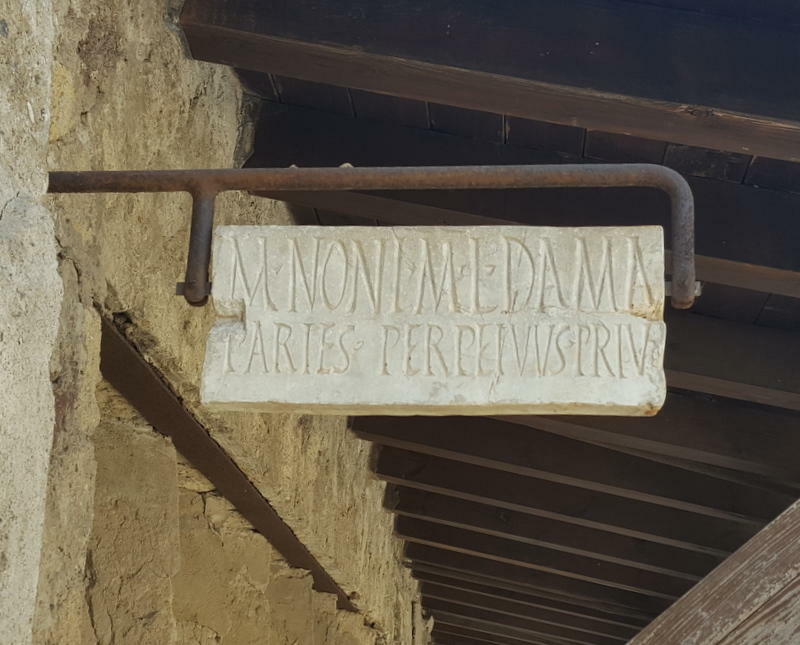 Being a house sign maker I was astounded by intact sign hanging on one of the unearthed Roman houses. I have tried to determine what the wording means but so far can't work it out as my ancient Roman is pretty limited. The lettering on the sign is V-grooved (same as our deep engraved house signs) but the sign looks like it was engraved on flat terracotta whilst it was still wet and pliable. I assume the plaque was fired after it was v-grooved with the letters. It has been like this for nearly 2000 years and just goes to show how long v-grooved lettering can last! There where other signs in Herculaneum but they where hand painted shop frontage signs which I neglected to take pictures of. The site is very well preserved and I would recommend anyone who is staying around Amalfi, Sorrento. Positano areas to go and visit the site. It is quite different to Pompeii which I have visited some years ago. Pompeii was a main town with grand buildings whereas Herculaneum was a much smaller seaside town which had a small harbour. As a sign maker I find it fascinating to see house signs from antiquity as it shows how our trade is basically the same - just the tools we use are more modern allowing us to create more accurate engravings on our house plaques but basically they serve same purpose - to help identify a house address or advertise a message on the property.